That’s a little harder to translate but it’s akin to “You scratch my back, I’ll scratch yours” – a kind of camaraderie you verbalize with people when you first meet, and again at the start of the new year. It’s not as warm as a big hug and kiss, but these two phrases carry a lot of weight on the esprit de corp scale. I said these phrases to my grandma on January 1 as she handed me a plate of beans, another Japanese New Year tradition. The sweet, black legumes are regarded as a force of good (not evil) and you’re supposed to eat one for every year you’ve been alive. 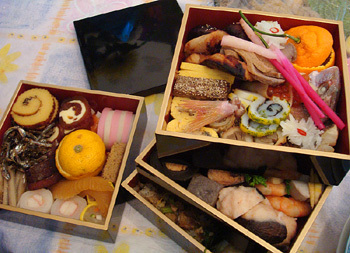 Pink and white fishcakes and soft-boiled vegetables are other fortuitous items. Who knows what’ll happen if you don’t eat them? I sure don’t, but I’m not willing to find out. It’s still cold outside so I hope everyone bundles up and sips hot chocolate in front of a crackling fire. Have a tangerine while you’re at it. That’s a Japanese tradition as well. On January 2nd and 3rd in Minato-ku, Tokyo, as part of an annual New Year’s tradition called Hoyojutsu Jitsuen, there was a cultural demonstration of falconry, in which beautiful, majestic goshawks show how they catch prey. In this video (from November), large birds swoop low to the ground from trainer to trainer. Check out the windmill action as one of the trainers (or falconers) flings a tempting treat sky high for the hawk to catch. The birds move so fast that for a brief, horrifying moment, I thought the guy was throwing the hawk into the air after violently swinging it in a circle. 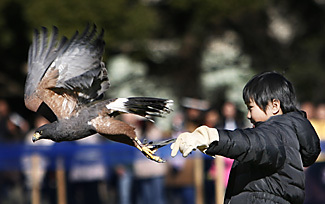 A leisure sport with military roots, Japanese falconry (takagari) dates back to the 6th century, where it was viewed as a status symbol and reserved for emperors and other nobility. Besides being dangerous, it was also extremely expensive, since it’s a pretty pointless exercise unless you have a lot of land! Takagari reached its peak popularity in the Edo period (1603-1868), but even today there are still falconry schools that claim to teach traditional methods.